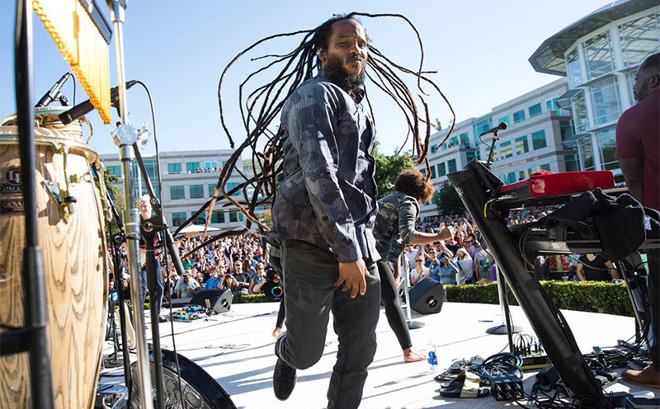 Apple invited employees to celebrate Earth Day with a Beer Bash at its One Infinite Loop headquarters in Cupertino, Calif., on Friday, an event featuring a performance by Grammy-winning reggae artist Ziggy Marley. As usual, those in attendance shared pictures of the event via social media outlets like Twitter and Instagram. CEO Tim Cook, who invited Marley onstage after a short address, and VP of Environment, Policy and Social Initiatives Lisa Jackson thanked the musician for attending and included photos of the set in a pair of tweets posted after the performance. In a tweeted response, Marley thanked Cook for the opportunity, heaping praise on Apple's environmental efforts. "[G]ive thanks @tim_cook for having us[.] we had a bag of fun today it was my first set fully powered by solar energy. thank you for the example you set for companies around the world. #apple is fully solar. #earthday," Marley said. Apple earlier this month announced its global infrastructure runs on 100 percent renewable energy. From retail stores to data centers and office buildings, including the new Apple Park headquarters, Apple's entire operation is powered by renewable sources like solar, wind, biogas fuel cells and micro-hydro generation systems. Marley appended his tweet by tagging Conservation International's account, an organization with which Apple is partnering as part of ongoing environmental efforts. On Thursday, Apple unveiled a series of Earth Day initiatives including a new GiveBack trade-in program that allows customers to trade-in their old device for an Apple Store Gift Card or free recycling. To celebrate Earth Day, Apple will make a donation to Conservation International for every device received through April 30. In addition to the GiveBack program, Apple introduced a new version of its iPhone recycling robot. Named Daisy, the updated machine can dismantle nine different iPhone models and sort their various components for recycling at a rate of up to 200 devices per hour. A semi-annual event, Apple's Beer Bash regularly sees big-name musicians stop by the company's headquarters to entertain employees. The last major gathering was held in December, when Gwen Stefani was invited to help ring in the holidays. Prior to that, Apple celebrated its 40th anniversary in 2016 with a Beer Bash featuring Zane Lowe and other Beats 1 personalities.